The air is chillier and the sweaters are woolier. The leaves are changing color, and it’s time once again to enjoy autumn’s frights and delights. While ghosts and goblins, apples and gourds, black cats and broomsticks capture our attention, seasonal spices capture our senses and conjure the essence of fall – wherever we may wander. 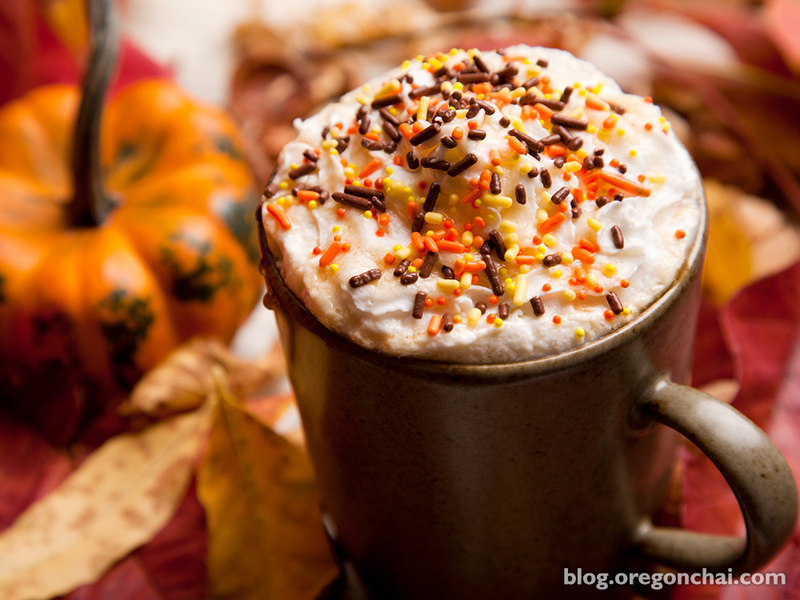 Delight your senses with a mug of Oregon Chai’s Pumpkin Chai Latte, which combines pumpkin pie flavor and classic chai spices for a delightfully warm and savory taste of fall in every mug. In a glass or paper cup, mix the Chai, Syrup, and espresso. Add heated (preferably steamed) milk and enjoy a warm, spicy treat on a cool autumn day. Pro Tip: You can also use cold milk, pour over ice and top with whipped cream, for a cool treat just like a slice of pumpkin pie! There’s no better way to enjoy a fall latte than with more flavors of fall. Try one of these delicious autumn desserts for a taste of the best season of the year in every bite. After a late morning of pumpkin picking with friends, bake these crunchy Apple Chai Oatmeal Cookies together for an afternoon snack. Pour raisins into small bowl and cover with Oregon Chai Original concentrate, set aside. Combine oats, flour, baking powder, salt, cinnamon and nutmeg and set aside. In a separate mixing bowl, combine sugars, add butter and beat until creamy. Add egg and applesauce and blend until smooth. Add flour-oat mix and blend. Add chocolate chips, raisins and walnuts. Drop by rounded teaspoon onto greased cookie sheet. Bake at 350, 10-12 minutes. Pumpkin and cream cheese go together like me time and chai. Feed your soul, and your belly, with one of these warm muffins while you daydream on the porch. In a large bowl, combine sugars pumpkin, oil and eggs. Beat until well blended. In a separate bowl, mix together flour, soda and salt. Add to pumpkin mixture and mix well. Stir in Oregon Chai Original concentrate and currants and blend together. Spoon into paper lined muffin cups filling two-thirds full. Bake at 350, 40 minutes or until done. Place muffins on rack to cool. Cool completely before icing. To prepare icing: beat cream cheese with butter until smooth. Beat in powdered sugar. Gradually add Original Chai concentrate until icing is smooth. Spread icing on cooled muffins. What’s your favorite fall activity? Do you like to get spooked at haunted houses? Do you take long afternoon strolls through the park? Leave your thoughts in the comments below!